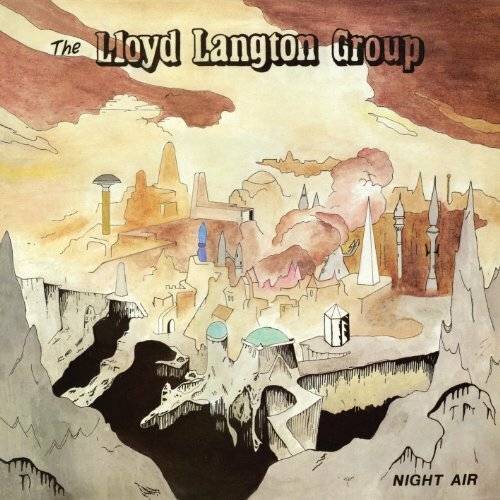 Huw formed Lloyd Langton Group (LLG) as a 3-piece in the early 80s. When he wasn't rehearsing, recording and touring with Hawkwind he needed an outlet for material he and his wife Marion had written over the years. This material varied from his work with the 'Hawkwind - Mothership' although his guitar style in both bands remains distinctive to this day. LLG performed hundreds of gigs at venues round UK during 80s & 90s with two tours in Sweden. In London the Marquee was always the favourite. One album not mentioned here was the first release "Outside The Law" bootleg album – a very poor recording which astonishingly went straight into the top 10 of the independent charts. An album we are not proud of although purists love the rawness of it. We tried for years to get it deleted. All 7 CDS are not currently available but will all be re-released over next year or two with bonus tracks previously not released. LLG has had many line-up variations with some amazing musicians contributing both here and in Sweden. All these musicians are worthy of mentioning for either standing in, touring or recording with LLG. The list is not in any particular order. Apologies if you have stood in or contributed to LLG and are not mentioned here. Tim Williams – keyboards & synth – recorded on new LLG album 'Hard Graft'. Jon Harris – bassist – produced & recorded 2 LLG albums at his studio 'Old Pink Dog', 'Time Space & LLG & 'Elegy' and toured with them. Warren Cann – drummer – worked with Huw, John Clark and Rob Rawlinson in the 'Magill' band. Although he played keyboards for a whole LLG tour. To compile this list of musicians who have worked with LLG has been an amazing walk down memory lane. Some really memorable times, fantastic tours sprinkled with some pretty bad ones. Some hilarious and dire situations got through often by Kenny Wilson's sense of humour. Good turn outs, bad turn outs but hey it's all rock 'n' roll. The majority of the artists mentioned above are still around playing there stuff. Sadly too, some very dear musicians and friends are no longer on the planet. This list of musicians Huw has worked with is not exhaustive as Huw has worked many other brilliant artists on many other projects. These pages purely relate to the history of LLG. What is not included here are all the brilliant roadies & technicians who made the gigs and touring possible. Don't send the bill! Alan & Crem, we are guessing you are still out there? However that will all be included in the book if it ever gets written! An Unofficial fan site for LLG on MySpace. We hope to provide you with a complete discography for the group, with samples of each album. Available for pre-order through Amazon and Atomhenge This re-recorded digitilised album is being released on 28 Jun 2010 by Atomhenge. ATOMHENGE, the home of HAWKWIND s catalogue from 1976 1997, continue their series of definitive reissued editions of these classic albums with the release of NIGHT AIR , the 1985 album by HAWKWIND lead guitarist HUW LLOYD LANGTON and his band comprising KENNY WILSON on bass and JOHN CLARK on Drums. The album was originally released on the Flicknife label and was a top five hit on the UK Independent album chart upon release. HUW’s compositions and guitar playing graced many HAWKWIND albums from Live’79, Levitation to Xenon Codex . NIGHT AIR featured such outstanding tracks as Got Your Number, Lonely Man and Diseased Society . Re-mastered from the original master tapes, this edition also includes both sides of TWO rare singles from 1983 featuring the tracks: OUTSIDE THE LAW, WIND OF CHANGE, WORKING TIME and I SEE YOU. 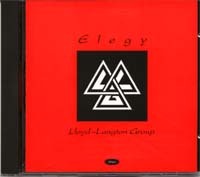 The below LLG Cds are no longer available from this site or on the market although there might be some old stock floating around. However, watch this space as we are planning to re-release the entire back catalogue with previously un-recorded bonus tracks & footage' over next year or so. OutsideThe Law (Flicknife) Sharp 015 Bootleg: we do not recommend purchase! Huw's Instruments and equipment used over the years. In the early Hawkwind days Huw used a Gibson 335 and a Hi-Watt stack (valve amp) – where possible he has always favoured valve amps and Gibson guitars. He didn’t really use any pedals at this point. A Gibson Les Paul (Custom 20th Anniversary edition) – nicknamed ‘Lizzie’ his top favourite electric guitar. No specific amp used then just any valve amp that worked and was provided by the management – Jet Records. He used an Ebow during this period bought in the States – which he still has and still uses! Gibson Les Paul (Lizzie) and a Howard Roberts Fusion guitar (another favourite guitar). Roland Synth Guitar – gigging & recording. They were sponsored by Westone for a period here and Huw used that guitar. Ampwise: A Roland Space Echo, a Roland Blues Cube then Peavey Combo Amps – Huw was sponsored by Peavey for many years! He thinks they are great amps. Huw tends to practise and write on a 12-string Ovation Bass guitar, his Samick Electro acoustic and a Gordon Smith 12 string electric. For recording he usually uses one of the Gibsons and one of the Samicks. On ‘Hard Graft’ the new album he used aGibson ‘Black Beauty’, loaned by Richard Gillespie LLG Bass Player. It used to belong to a great friend of us all, Gollie ‘Osibisa’ Guitarist who died. 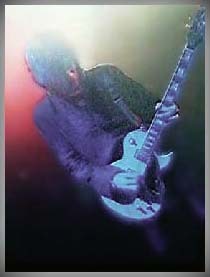 For electric gigs he tends to use his Gibson Nighthawk or Gibson Blueshawk. They are much lighter than ’Lizzie’ thus easier to carry around. When he got ‘Lizzie’ he practiced yoga for a long time to be able to carry the weight of it when he had to play on stage for 2 hours or so. For acoustic gigs he tends to use one of the Samicks. In truth while his guitars have lasted the course his amps haven’t. Huw has had so many over the years. Not because they haven’t been good amps but because constant usage and touring kills amps even in flight cases! They have very rarely lasted more than two years! At the moment he is using a Marshall AS50R amp for the road and recording. At home uses a Roland Cube practice amp and a Samick SM10 practice amp. Practice amps seem to last for years because they don’t go on the road! Self taught - self styled guitarist/songwriter/singer with extraordinary talent. Huw reads and writes both rock and classical music and is renowned as an original member of Hawkwind and as such, he has been in and out of the band ever since. Born in Harlesden, North London, Huw started playing guitar at school. His first professional gig was in Germany with WINSTON G, a very popular band in Europe. He toured with them continuously for 6 months. The bass player was Pete Becket from PLAYER and LITTLE FEET. 1971 to 1979: Came a variety of gigs. A 2-year acoustic stint in vegetarian London restaurant PASTURES. John ButlerDIESEL PARK WEST'S singer joined him for 6 months and Eddy Klima, RATTLES singer for a further year. He taught guitar at a comprehensive school in Streatham for a year and did numerous sessions, one included writing the music for a cartoon, narrated by Viv Stanshall, BONZO DOG DOO DA BAND and 6 months with LEO SAYER touring UK & Europe. Several band situations including working with John Lingwood MANFRED MANN'S long standing Drummer. AMON DIN with Dave Anderson AMON DUL'S bass player. GALLERY with Rob Rawlinson on Bass from Ian Hunters OVERNIGHT ANGELS. MAGILL with Pete Scott from SAVOY BROWN. Huw toured Yugoslavia with ALEKZANDER JOHN (known as Alekzander Mezek) who to this day is still their top artist. Another excellent band was the Trinidadian Band BATTI MAMSELLE, whose music had a strong Latin American influence with lead singer LONDON BEAT'S Jimmy Chambers. They appeared in briefly in the film 'Alfie Darling' starring Alan price. The Director wanted an all black band but they refused to perform without Huw. From 1974 to 1978 he joined WIDOMAKER touring the USA and recording 2 LPs, which charted there. Lineup included Steve Ellis- LOVE AFFAIR, Aerial Bender- MOTT THE HOOPLE, Bob Daisley-RAINBOW, Paul Nicholls LINDISFARNE and 'John Butler ', again)! In 1979 he rejoined HAWKWIND where he remained for the next 10 years. Their LP 'LIVE 79 went straight in the top 10 UK charts. Everything Hawkwind did between 1979 and 1985 was either in the pop, heavy metal or independent charts. 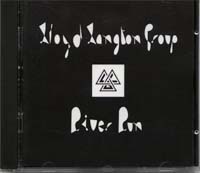 In 1982 Huw formed LLOYD LANGTON GROUP (LLG) to gig between HAWKWIND quiet periods. LLG has 2 singles and 2 LPs in Heavy Metal charts during 80s. During this period he had his own column in GUITARIST magazine for 6 months titled 'Langton's Lead Lines'. 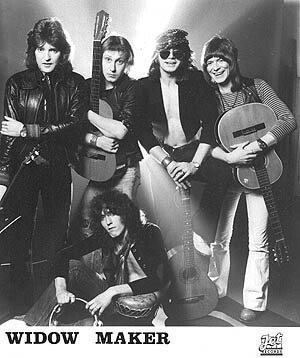 Since 1989: Huw joined PRETTY THINGS on one European tour. Toured Italy in '93 with DR BROWN who had 2 independent hits there. Toured UK several times with LLG. Spring'95 he toured Sweden with Ray Majors MOTT THE HOOPLES last guitarist and has been back twice with the LLOYD LANGTON GROUP. August'97 saw Huw join Hawkwind as a special guest at Blackheath Concert Halls raising over £8,500 for Shelter's work with the Homeless. During 1993 to 1998 Huw also taught guitar at the Kilburn Community Centre.Huw has performed numerous solo acoustic concerts both in UK, Denmark and Sweden. Apart from his work with Hawkwind & LLG Huw recorded with Michael Moorcock on DODGEM DOOD, the late but much loved Bob Calvert and Nick Potter on MOUNTAIN MUSIC. 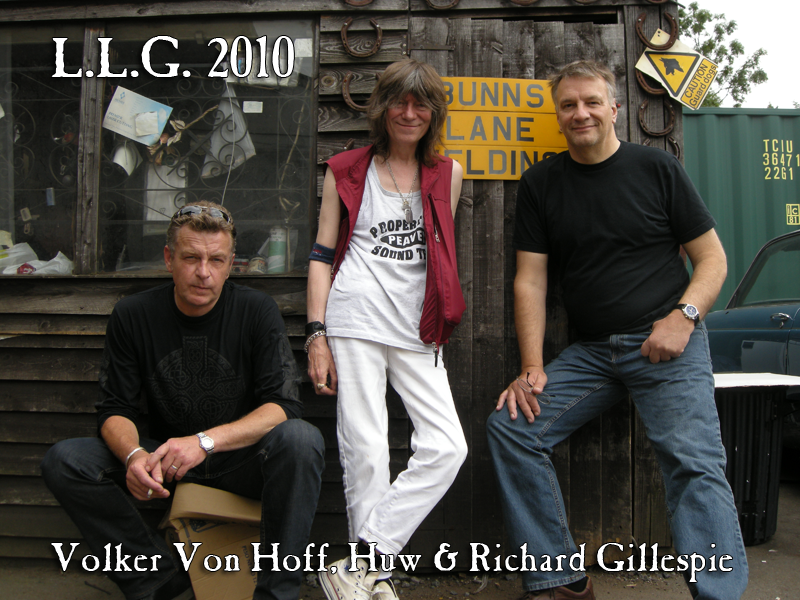 Huw's last LLG CD 'Chain Reaction' was released in 1999 exclusively by mail order on this web site web site. (See order button above). In 2000 earlier LLG records 'Night Air', 'Like an Arrow' and 'Time Space & LLG' were released by Voiceprint with distribution through Recognition/Universal..
September 2000 Huw rejoined Hawkwind for 'Hawkestra Re-Union' gig at Brixton Academy. This sell-out show featured 21 past members, including Lemmy. However, the main nucleus on stage throughout was Dave Brock, Alan Davey, Richard chadwick and Huw Lloyd-Langton. 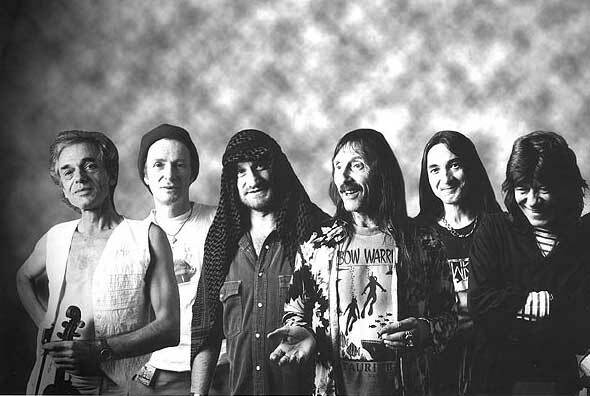 Huw officially rejoined Hawkwind in 2001. They played their first major Tour in the UK since 1977 playing 18-dates nation-wide in November 2001. They kicked-off at London's Royal Festival Hall on 10th October. Huw contracted 'Legionnaires Disease' on the Hawkwind 2001 tour and was hospitalised. This left him extremely fragile. Hawkwind toured UK again December 2002 but Huw was unable to complete last two dates and has suffered ill health on and off over next few years with a variety of broken bones (mainly arms and wrists). Huw is featured prominently in the new commercial biography of Hawkwind by Ian Abrahams: "288 pages Hardback, circa 100 photographs and illustrations, contains dozens of new interviews and fresh insights from past and current band members, friends and associates". Between 2002 to 2007 fragile though he was, he did do a series of acoustic concerts, solo charity gigs, a few LLG gigs with Kenny Wilson, John Clark and Gonzalo Carreras and countless open mike nights. He had regained full health by end of 2007 and started writing music again. LLG in the form of Volker Von Hoff on drums, Richard Gillespie on bass & Huw reformed purely to rehearse & record an album in Mill Hill Studios. The idea was to re-record classics from LLG's various albums. Huw wasn't keen instead he took new songs into the rehearsal studio written by him and Marion. Initially the boys were taken aback as they hadn't heard any of the tracks but they got down to it and in 2008 they recorded 'Hard Graft'. They finished the album. But 2 weeks later in September Tim Rice Williams the brilliant keyboard player whose work is featured on the album died suddenly of cancer. He had been a much loved friend of Huw & Marion's for over 30 years. Huw lost heart in doing anything with Hard Graft. Early 2009 Marion & Huw were talking about doing something to try & help Cancer patients. LLG agreed to donate a track from Hard Graft to the Killing Cancer Charity. Richard Gillespie's idea was to approach Universities round the UK to animate a 2-minute edit of the song chosen 'The Landlord'. Thus LLG's Killing Cancer campaign was born. Full details are under the Killing Cancer section of this site. but in short 'The Landlord' was rejected as the charity wanted a song specifically written for 'PDT' Photo Dynamic Therapy. PDT is a cancer treatment the charity was lobbying to bring into the NHS along side other cancer treatments. Marion wrote the lyrics and LLG went back into the studio. Huw didn't like the music ideas he had come up with for the PDT lyrics. He had the idea to record the lyrics over the music orignally witten for 'The Landlord'. It worked the PDT single was recorded and work on the animation competition started. The PDT single was released by Cherry Red Records September 2009 as a global digital download. In the meantime LLG decided to do the final mix for Hard Graft in a studio in Poole but a lot of Huw's guitars and vocals were lost in transference between the two studios. Over next few months in 2009 Huw & Richard were back in the studio in Poole re-recording the lost tracks. As luck would have it all Tim's work and Volker's drums had not been affected by the transference & had been saved. 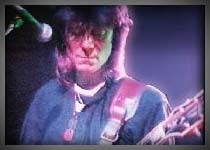 On August 29th & 30th 2009 Huw played solo acoustic concerts at the Hawkwind 40th Anniversary in Porchester Hall, London. Then disaster struck again in September 2009 Huw came down with food poisoning, causing septacaemia and renal failure. The album was shelved again! Huw fought back and amazingly left Hospital November 2009. Yet again, a very fragile Huw but back on his feet. December 2009 Huw played a solo gig at the Hawkwind warm up gig for their December tour in Southampton. He was met with a standing ovation when he arrived on stage! Heart warming to say the least. Work continued on Hard Graft and it was finally finished March 2010 alongside the finish of Killing Cancer animation Competition. On 2 March Huw played an acoustic concert for the Killing Cancer Charity at Club Banus in Weymouth with local musician's Mark Brooker on flute and Mark Warder on Kahon. The event was extremely well attended with top South Coast DJ's also contributing their services freely in other rooms at the venue. All proceeds went to the charity. 2 May 2010 Huw & LLG played at the Hawkwind all dayer, The Assembly, Leamington Spa. It was a great day all round! Huw and LLG were very well received. There will be a live video of Huw & LLG from this concert out later in the year to coincide with the release of Hard Graft.